A convenient and rewarding recycling initiative has sprouted on campus offering more than just cents in exchange for cans and plastic bottles. The Dream Machine has a wireless Internet connection that allows consumers to learn more about recycling, accumulate points for rewards and keep track of their recycling activities. Cal Poly Pomona is the first university in the nation to house the Dream Machine kiosks, which are supported by a partnership between PepsiCo and Waste Management. For the past year, Brett Roth, director of foundation dining services, has been working to have these machines installed. 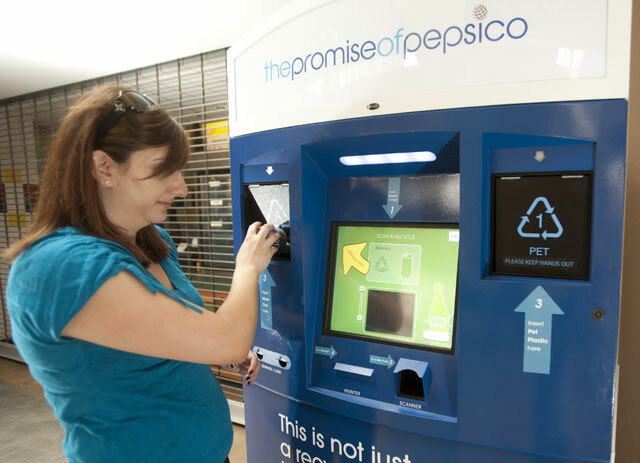 “The folks from PepsiCo have been really helpful trying to support recycling programs on campus and partnering with Cal Poly Pomona early on to make the Dream Machines available,” Roth said. The kiosks were installed in late spring. The large blue machines, similar in size and shape to a Red Box DVD rental, have a touchscreen display, a scanner and designated slots for bottles and cans. The recycling process begins when users enter their name and other basic identifying information and receive a rewards-type card. Before depositing recyclables into the machine, each item’s barcode must be scanned and recognized. Once all items are scanned and deposited, the machine gives users the option to print a receipt with account information and the number of points earned. Points can be redeemed for discounts around campus (starting in the fall) or for entertainment, dining and travel coupons at Greenopolis.com. Each point equals one cent of CRV. Cal Poly Pomona’s main goal is to recycle 20,000 bottles and cans by December, Roth said. The university does not profit from the machines, but for every bottle or can recycled, PepsiCo will make a donation to the Entrepreneurship Bootcamp for Veterans with Disabilities, a national program offering free, experiential training in entrepreneurship and small business management to post-9/11 veterans with disabilities. Two of the three machines on campus – one in the Bronco Student Center and one at the Campus Center Marketplace – are operational. The third will come into service when the new Vista Cafe opens. The machines can be used 24 hours a day but will automatically shut down once they are full.